We have found a place that allows you to reminisce about the warm memories from your Italian cooking holiday: La Bottega in London is sharing its Italian food and Christmas tips with us! My father is a great home cook and my mother loves entertaining at home: the combination created multiple opportunities for a young kid to mess around the kitchen plucking birds, extruding “bigoli” or tossing “frittelle”. At La Bottega we are trying to re-create the simplicity of the same authentic Italian home cooked food I have enjoyed since I was a child. The festive Christmas period has begun – What will a true Italian like you have for the holiday? Every Italian region has its own special treat for the Christmas lunch. And of course weather has a significant influence on the choice of food. Since I usually spend Christmas with my family in London, I usually favour northern Italian specialties, more adequate to colder weather. This year I will cook home-made tortellini in capon broth, veal brasato (slow cooked for a whole day with onions and wine) and of course a Pandoro from La Bottega as dessert. On our cooking holidays, we create so many delicious Italian dishes. What is your favourite one? Italian food is simple yet so extraordinarily diverse: I could not choose one single dish simply on the basis of taste. However, as happy memories often elevate the taste of a dish, if forced to pick I would choose Casunziei with poppy seeds, melted butter, sage and grated parmesan cheese – a typical dish of the Veneto region where I spent my childhood. Alba, at the end of October: there is no better way to eat a bucket of white truffle at its best without having to sell your house. At La Bottega, we go every year and ship directly to London twice a week for our customers the best white truffle we can find, at a really fantastic price. As we are passionate about Italian cooking could you share your favourite recipe with us? 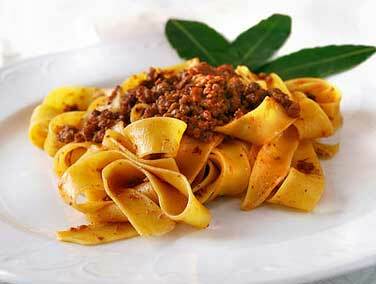 Meat ragu (Bolognese): I use a mix of minced pork (200gr), veal (200gr) and, less conventionally, lamb (100gr). Chop 1 onion, 2 carrots and a couple of stalks of celery and cook in a large, heavy-bottomed pan with some olive oil. When the mix is softened, add the mixed mince and cook on a high heat until each single “grain” is well cooked and starts sticking to the pan. Pour in a glass of dry white wine and let it evaporate, mixing vigorously to deglaze the bottom of the pan. When the wine is fully evaporated, add 100gr of tomato puree (or 200gr of tomato passata): mix and let the water in the tomato evaporate and the paste take a dark red colour. Finally cover with full fat milk, lower the heat and let the sauce simmer for 2hrs or so, adding more milk along the way if necessary. Season with salt at the end. Serve with fresh egg tagliatelle, grated parmesan and a sprinkle of extra virgin olive oil. 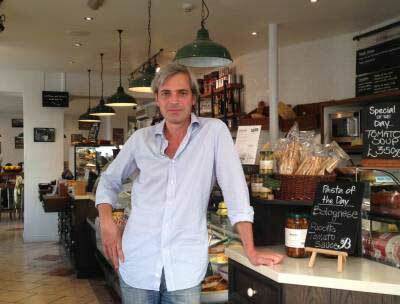 I’m Piergiorgio Lo Greco and I run La Bottega, a small group of Italian delicaffès in London. In Italy a ‘bottega’ is a small business which is a combination of grocery shop, delicatessen, bar, coffee bar and caffè, a place to go at any time of day for a coffee, a glass of something, a meal or to buy some fresh food, groceries or drinks to enjoy at home. There’s no real English equivalent, but you find ‘bottegas’ in neighbourhoods all over Italy, serving their local communities, just like we do here in London. We like our customers to feel at home, whether they are popping in for a coffee, grabbing a take-away or staying for a meal. On top of outstanding Italian-style coffee drinks, we serve our customers exclusively authentic and healthy traditional Italian dishes, freshly made using only the best quality ingredients and at an affordable price. 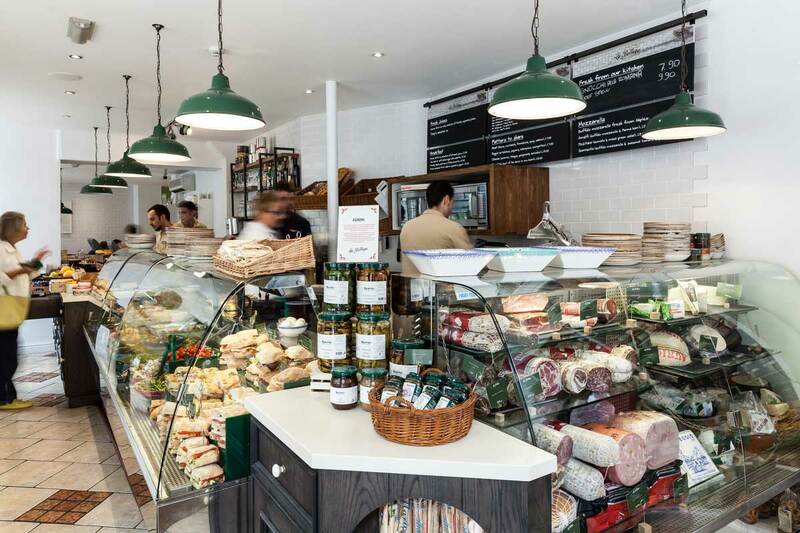 We also stock a range of top quality Italian groceries such as extra virgin olive oils, pastas, rice, sauces, biscuits and chocolate, as well as exceptional cured meats from Levoni and delicious regional cheeses. I hope to see you in one of our ‘bottegas’ soon.